Many homeowners envision spring and summer when they think of lawn care. But far from being dormant during the fall, your grass is preparing for winter by absorbing moisture, nutrients, and energy. Following these tips from Popular Mechanics will help your lawn get the care it needs in the fall to look its best in the spring. Don’t have the time, equipment, or expertise to go the DIY route? Not to worry, that’s what Mr. Tree and Lawn Service is here for! We provide an array of lawn care and tree services in Gainesville and the Alachua County area. 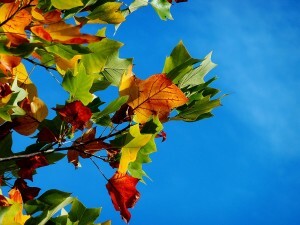 Your lawn will still need to be mowed and watered throughout the fall. As winter gets closer, set your mower’s blade to its lowest setting for the last two mows of the year. More sun will reach the grass’ crown, and you’ll have less browning during the winter. Aerate your soil so water and other nutrients can reach your grass’ roots. Rent a self-propelled lawn aerator, or call our Gainesville lawncare company to do it for you. Ever wondered what the point of leaf blowing is? It’s not just cosmetic; allowing leaves to sit on your lawn can suffocate the grass and allow fungus to grow. Fall is the optimal time to fertilize your lawn so your grass can develop deep roots and keep nutrients on reserve for spring. Apply a dry fertilizer in mid to late fall using a walk-behind drop spreader. If you have any bald spots in your lawn, apply a lawn repair mixture in the fall. This combination of grass seed, fertilizer, and organic mulch will help give grass a boost. Weeds, like grass, absorb energy during the fall. Use weed killer in early- to mid-autumn, and the weeds will eagerly absorb it. Summer storms, insects, and other factors can harm your trees, which in turn can lead to fallen branches and even entire trees uprooting and causing property damage. Contact Mr. Tree and Lawn Service for expert tree inspections, tree removal, and other tree services. The hours spent on lawn maintenance and tree care can definitely add up over time, not to mention the need to learn all of the ins and outs of proper fertilizing, mowing, trimming, etc. Thats why so many homeowners choose us for Gainesville lawn and tree services! Contact Mr. Tree and Lawn Service for help preparing your lawn and inspecting your trees to avoid winter-related damage.